The Divya Desams are revered by the 12 Azhvars in the Divya Prabandha, a collection of 4,000 Tamil verses. Lord Shiva, the other major deity in Hinduism, is similarly associated with the Paadal Petra Sthalams, 275 Shiva temples which are praised in the Tevaram canon by the 63 Nayanars. Worshipped by – Serpent Gods in Kritha Yuga, Bhoomi Devi in Thretha Yugam and Sage Markandeya in Dwaparayugam. 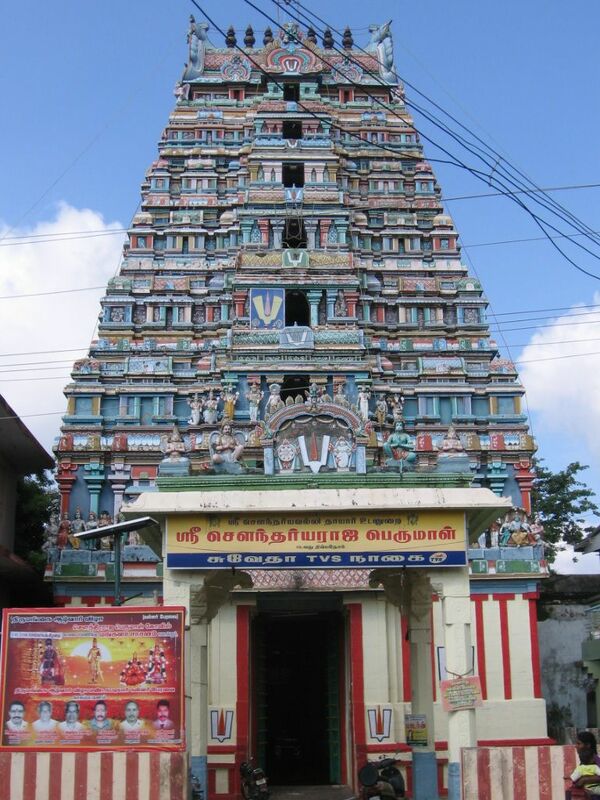 Thirunagai Sri Soundararaja Perumal Temple is one of the 108 Divya Desams of Lord Vishnu located in Nagapattinam district, Tamil Nadu. This is one of the oldest temples built by the Naga Kings; there were abundance of contributions made by the Kings of Maratha and Nayaks too. The fame of this temple is distinct and dates back across each of the 4 Yugams. In Kretha Yuga the Serpent Lord underwent severe penance praying to Lord Vishnu. Lord was pleased at the devotion of Serpent Lord Adishesha and accepted him as his celestial vehicle. Ever since Lord Adisesha began his self-less service to Lord at all times. Hence, this place has got its name Nagai or ‘Naaga’ Pattinam. It was here that Bhooma Devi, in Tretha Yugam, and ‘Markandeya’ Rishi, in Dwapara Yugam, undertook penance. Another story goes that Druva, a young kid (son of King Uthana patha) undertook deep penance wanting to rule the entire world. So pleased was the Lord that he came on the Garuda Vaahanam to grant Druva’s wish. However, on seeing the beautiful Lord, Druva’s mind changed, and dramatically so. Instead of wanting to reign the world, Druva requested the Lord to grant him Moksham and of seeing his beauty all the time at this temple. Lord can be seen in all 3 kolams here - standing, sleeping and sitting posture and is said to have given Darshan in each of these 3 postures to Naga Raja. Here Neelamega perumal lies in standing posture whereas Govindaraja perumal is in sitting posture and Ranganatha perumal in Sleeping posture. Thiru Mangai Azhvaar, in his Paasurams, compares Lord Soundara Rajan to Sarangapani of Kumbakonam, Sathya Moorthy of Thiru Maiyam, Kallarpiran of Sri Vaikuntam and KalAzhagar of Thiru Maliruncholai. There is a bronze statue of Narasimha where he is seen blessing Prahalad with one hand and destroying Hiranyakashipu with his other hands. 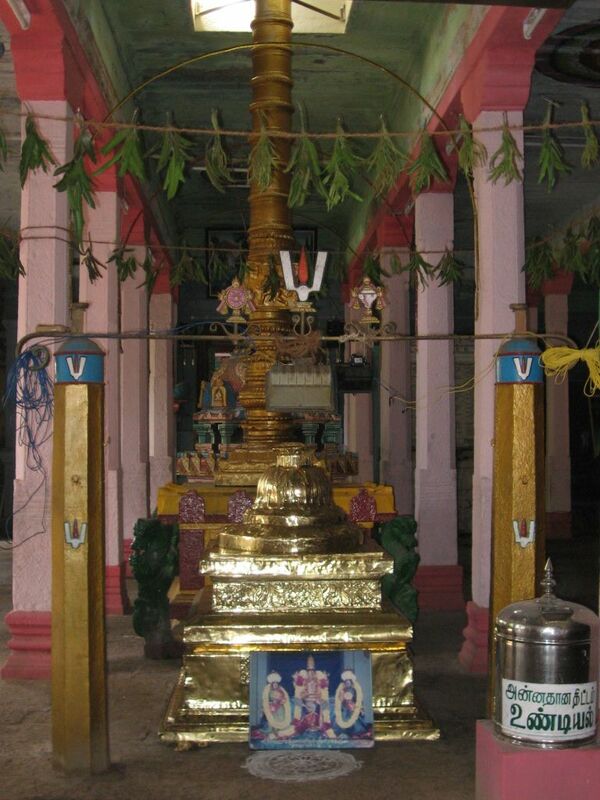 In Lord Ranganathar sannadhi there is an wounderful Bronze idol of Lord Narashima with eight hands. One hand of Narashima safely secures prahalatha, one hand blesses him by touching his head and the other hand's are killing Hiranya. In days gone by, the 7 tiered Gopuram of this Divya Desam had a light atop the tower that served as a ‘light house’ for ships coming into and crossing Nagapattinam. 07:30 am to 12:00 pm ; 05:30 pm to 09:00 pm. Auto : Auto will charge Rs. 40 from the Nagai New bus stand.